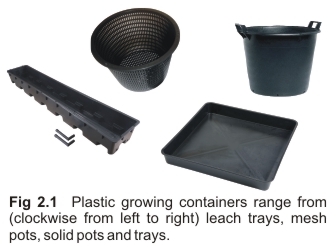 Container size: Ensure growing containers provide ample room for root growth. Root ‘hairs’ are responsible for the majority of nutrient uptake and their growth depends upon there being sufficient space. If root growth is restricted, the plants may never reach maturity. ● Ensure the trays and channels have suitable slope (gradient 1:40). ● Position drainage outlets as low as possible on the container’s sidewall, or preferably in the base. ● Place filter material (e.g. mesh) at the entrance to the outlet to help prevent blockage from roots or medium. ● Where feasible, use pots with mesh sidewalls or bases. These encourage aeration of the root zone, are less restrictive to outward root growth, and will ensure optimum drainage. Color: As with reservoirs, black and/or opaque plastic is best. This prevents light transmission and reflection which can harm nutrients and promote the growth of fungus and algae. Light exposure: Where possible, cover the surface of the medium to prevent light from reaching the roots. Plant spacing: Where a single growing container contains multiple plants, such as in an NFT channel, position plants far enough apart from one another so that their roots do not become entangled. This facilitates the easy removal of plants for harvesting (e.g. lettuce) or for those that are diseased.